It's June. Well, almost. June is the unofficial start of Catasetum season and our Catasetum fans are rejoicing (hi Tracy!). 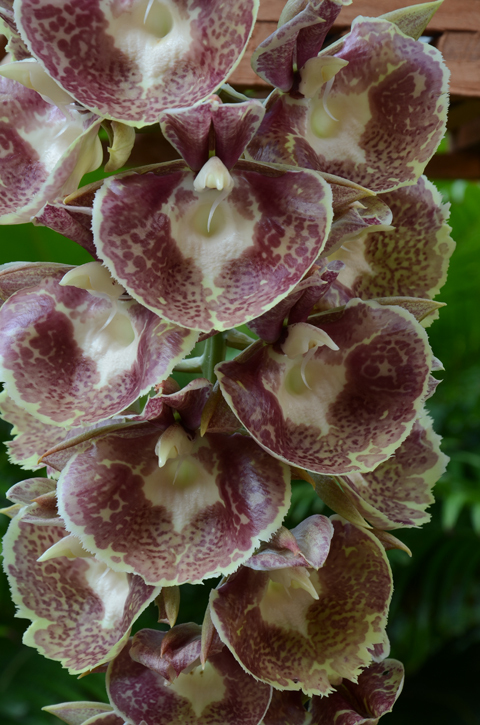 Castasetums are the most interactive of orchids. In the center of each male flower is a downward-pointing trigger lever (visible in the photo above). When the trigger is bumped by a pollinator, or pressed by a finger (please don't do this, as the flower dies immediately, ruining the display for future visitors), the pollen masses (pollinia) are flung outward. Check out this video to watch this in action. The intended recipient is a male Euglossine bee. But the pollinarium (pollinia plus adhesive disk) will also adhere tenaciously to a pencil, finger, forehead, whatever. It will emerge intact from the laundry, still clinging to a T shirt. Stop by and see them in the Orchid Display House this summer.